Samsung has high hopes for the LTE packing Galaxy Note I717 in the United States. Since its launch during CES, the AT&T exclusive device has enjoyed a marketing push like no other Samsung offering to date, including the Galaxy S II lineup. It appeared in a Super Bowl commercial, it starred in New York's Fashion week, etc. The subject of this review is yet another case of an international Samsung device, gone through a character makeover before hitting the U.S. shores. To be in line with its American siblings, the I717 features four touch sensitive buttons under its screen. A Snapdragon S3 chipset with two 1.5GHz Scorpion cores has replaced the capable Exynos silicon of the global version. The changes however are not in any case a downgrade. LTE connectivity has been added and with a 5.3" Super AMOLED screen and an S Pen on board, the Samsung Galaxy Note I717 has a market niche of its own. Here is a look at the key features of the Note I717. As you can see, the AT&T Galaxy Note's spec sheet is long enough to satisfy even the most demanding users. As far as the phoneblet's disadvantages go, the substitution of the powerful Exynos chipset for a Qualcomm made one is probably the biggest letdown in the U.S. Galaxy Note. The Snapdragon S3 is simply not as powerful. You do however, get LTE connectivity thanks to it - a nice way to ease the pain over the lost oomph. So, does the Samsung Galaxy Note I717 have what it takes to make people ditch their current smartphones and tablets for a device, which tries to do it all? Read on to find out. As always, we will begin with an unboxing, followed by design and build quality inspection. Editorial: You might notice that this review is shorter than usual and doesn't include all of our proprietary tests. The reason is it has been prepared and written far away from our office and test lab. The Samsung Galaxy Note I717 for AT&T is a US-only phone, so it will probably never get to the shores of the Old Continent. Still, we think we've captured the essence of the phone in the same precise, informative and detailed way that's become our trademark. Enjoy the good read! very nice phone sgh 1717...only the problem is battery...easy to drained...even the phone is not using...battery drained continiously.. but i told you this is the best phone....i hope you help me to how to save battery life. why no update os for note lt GT N7005? ICS too slow for this smarthone.. 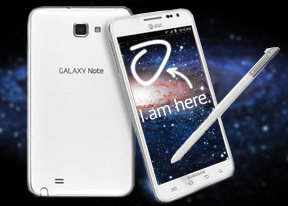 Note 1 have already so when for note 1 lte?